Origin of Agile Unlimited - AgileUnlimited - Lever your Business! "We all have a limited amount of time, and where you spend it and how you spend it is just an incredibly levered way to think about it." The world is not black or white and for sure not magenta. After five years working as an Agile Coach and Trainer at Deutsche Telekom (from the beginning of 2010 till the end of 2014) I needed different colours of Agiliy and I started an experiment: 2015 was a research project. I called it "Agile Unlimited". I was dedicating this year to the curiosity of what makes companies successful and how they can innovate. I was dedicating it to the Agile and the Lean spirit and new impressions and ideas of Agile work environment. To be able to do this I left the magenta world of Deutsche Telekom and quit my job by the end of 2014. After that I offered my knowhow, my motivation and my experience as Agile Coach to the Agile community - for free as a volunteer. I was fully open minded and followed my very personal motto: "We all have limited amount of time, where you spend it and how you spend it is just an incredibly levered way to think about it". 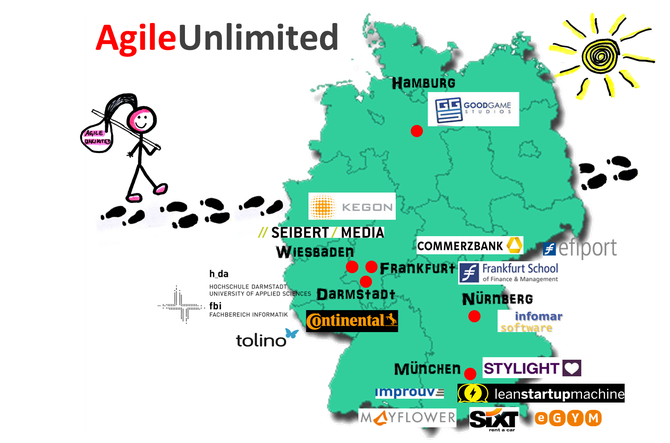 I started a one year journey as Agile Coach through Germany and I called the tour AgileUnlimited. 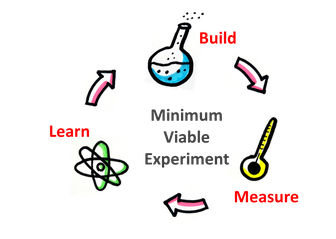 Using Lean Startup methods I was developing the one year tour step by step and I learned a lot. Startups cannot hire expensive consultants or coaches. Middle-class companies and multicorporated enterprises need fast assistance, but their processes are complex and slow. Universities need help teaching their students about Agile work environments, but they don't have the right contacts to available specialists. My expermient was: I offered my experience and my motivation as an Agile Coach to every company, startup and university that needed help in developing successful and innovative products and organizational environments levering through Agile methods. AgileUnlimited was an amazing tour through Germany. During one year I worked with 15 different companies on their individual Agile approach, were talking on community events and conferences and found my way into self employment as Agile Coach. Today, I work as an independent and self-employed Agile Coach and I founded AgileUnlimited. My clients belong to different industries e.g. IT and Digital Services, Banking, Telecommunication, Health Care and Automotive from middle class businesses and especially multicorporate enterprises. Parallel I am an university lecturer. I teach "Agile Projectmanagement" at the Frankfurt School of Finance and Management and hold the lecture "Entrepreneurship and Agile Business Development" at the University of Applied Sciences in Darmstadt at faculty of computer science. 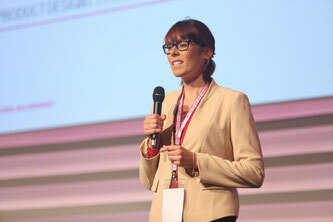 Furthermore I am a mentor at the annually Lean Startup Machine in Munich.